Desert Ridge took a hard fought win against a very tough Red Mountain squad on Friday night. The first half was a little slow going for the Jaguars who couldn’t quite seem to find their rhythm. The defense stood strong keeping the game in front of them but a great strike from outside from Red Mountain beat the goalkeeper to give the Mountain Lions a 1-0 lead going into halftime. Desert Ridge regrouped at halftime and came out on a mission from the opening kick. The half started immediately with Desert Ridge forcing a long throw opportunity deep in their attacking third. The Jaguars kept up the pressure and just minutes into the second half a couple of Senior team Captains connected for a goal. Keith Renteria found Ed Ortega who hit an incredible strike from outside the box that found the upper corner of the goal to tie it up 1-1. Only five minutes into the second half, the Jaguars forced another long throw and this time it proved deadly when another Senior Captain came through clutch. Payton Gardner launched the ball into the box where Branson DeWitt headed it home to give the home team a 2-1 advantage in front of a great crowd. 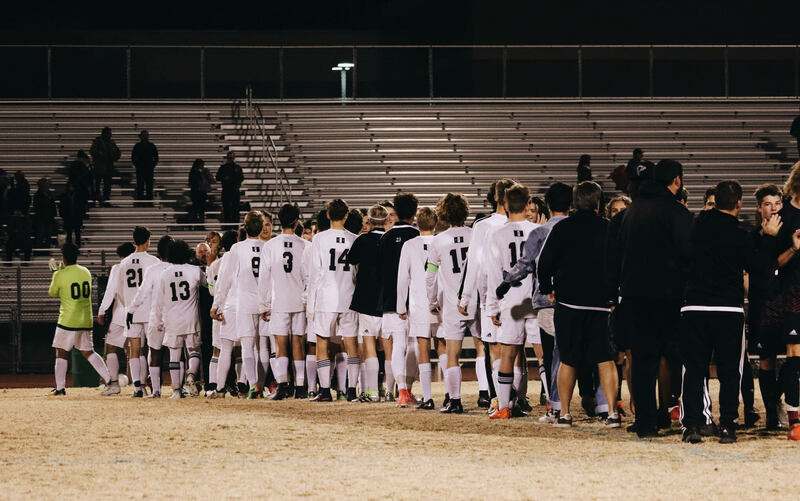 The Jaguars kept up the intensity throughout the second half, even as Red Mountain created a couple of dangerous opportunities for themselves. Desert Ridge had some chances of their own but were unable to open up the game further. Thankfully, the boys played great team defense and finished the game strong to preserve the 2-1 victory. It was a performance that showed the teams heart and determination. The boys played hard and refused to be denied in the second half. Desert Ridge will look to continue the positive momentum into the “Kings of Crismon” rivalry game on Tuesday at Skyline. The boys are now 5-3-2 overall with a 2-2-1 conference record.